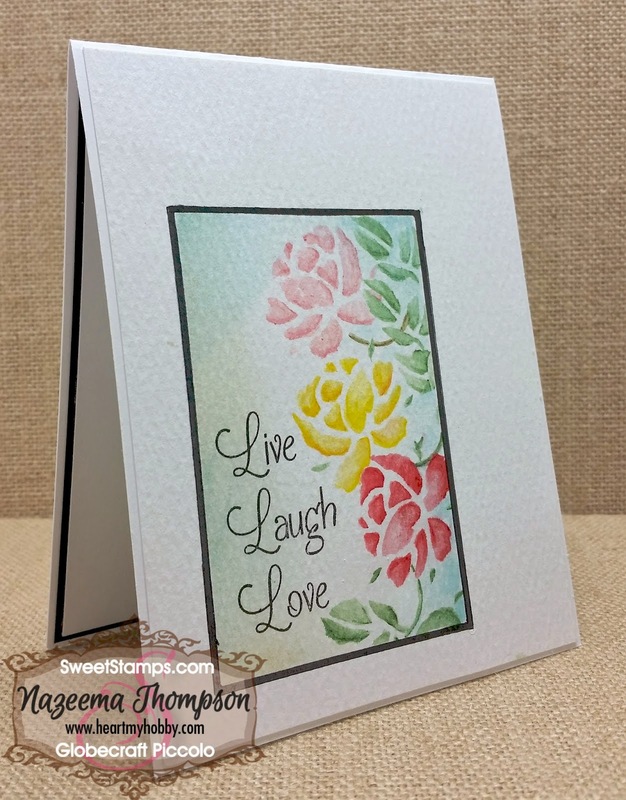 Nazeema, here to share a fun way to use the stencil just released last month. This week, it was all about flowers. So going with the theme, I grabbed the new Spring Florals stencil. This stencil is 6x6 and has 4 different flowers on it, which are all fabulous. For my card today, I used only one of the roses for this card. I started by cutting the rectangular shape using a die and scrap piece of cardstock. I did this because, I knew I was going have a great white space area and this was easier than masking. Using the Spring Floral stencil, I added some color using my Intense color pencils. Holding the stencil in place, I took a small brush and very little water and colored the area. I did the same step for the other two roses, just flipping the stencil and turning it to get a different angle. After the water dried, I rubbed the edges with Blue China distress ink. It was a little brighter than I wanted it to be, so I toned it down with Antique Linen. I created a thick border around the image and stamped the sentiment. Beautiful design, I love the way you layered the roses and the sentiment.